Rhiannon Giddens & Dirk Powell Acoustic Duo - Otter Productions Inc. | Otter Productions Inc. Rhiannon Giddens & Dirk Powell Acoustic Duo - Otter Productions Inc.
Cal Poly Arts and Otter Productions, Inc. are pleased to announce another Center Stage event to be presented at the historic Fremont Theatre: RHIANNON GIDDENS & DIRK POWELL in concert, 8 p.m. on Friday, November 18, 2016. Advance reserved tickets are on sale now; online at www.vallitix.com and at Boo Boo Records in SLO, call (888) 825-5484. Tickets $25-$37 plus service charges. All ages. Cajun/Creole musician Powell joins Giddens for an acoustic evening filled with a unique blend of song and sound that touches on all of what makes American Roots music the resonant force that it is. 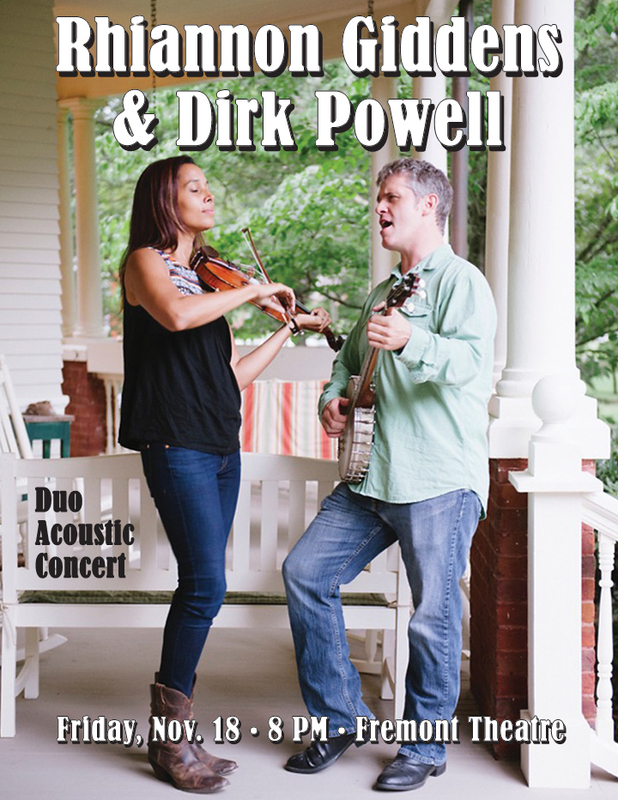 Rhiannon Giddens & Dirk Powell Duo Acoustic Concert, Friday November 18, 8PM at the Historic Fremont Theatre in downtown San Luis Obispo. All Ages.